ChiroWrite provides a unique workflow engine called Worxflow. It allows the doctor to configure the order that the examination and SOAP screens appear. It also allows for the creation of many workflows. For example, you may do a certain number of tests for a knee problem and another set of tests for a back problem. You can configure multiple workflows so that only the tests you want to see are within each flow instead of seeing all tests and passing over those that are not needed. This feature reduces the number of items the doctor has to go through to complete an examination. The WorxPhrase engine allows you to configure standard sentences/paragraphs that you use often and store them for quick retrieval. The text can include dynamic tags that are replaced by the system. For example, a sentence such as " is complaining of lower back pain. feels this pain after any moderate activity." would be converted to "Mr. Smith is complaining of lower back pain. He feels this pain after any moderate activity.". Using the WorxPhrase engine, a doctor can greatly reduce the amount of typing they perform. 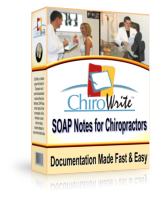 ChiroWrite allows a doctor to copy the information from a prior visit to the current visit making for rapid data entry. For example, if you are doing a SOAP and the information from this visit is the same as the last, then copy the last visit and you are done. If you are doing a final exam, copy the initial or mid-term visit and then change values as necessary. Time is again reduced for completing examination and reporting requirements. The system has been designed to be simple yet powerful. The interface makes use of point-and-click actions as much as possible. This was a requirement for Pen enablement and has therefore simplified the system screens and interface. Images such as x-rays and other photos can be included on the patient's file. These images can be viewed and then marked-up using the pen when using the Tablet PC. All images are listed from a single screen and from there, you may see a larger image as well as markup the image. The system has been designed to allow the doctor to configure their own images into our workflow. This allows the doctor to continue to use images they are familiar with such as drawings of the spine, body, muscle groups, etc. The report text is customizable. If you do not like our verbiage, then you may change it or add more of your own. Reports have been divided into simple Sections and Sub-Sections to make navigating the report easy. The report templates are editable from within Microsoft Word. Changes can be made and saved using an industry standard word processor. An example of a change that is frequently done is to add an office logo to the template. Reports that have been generated are open in Microsoft Word. This allows for easy editing if you decide to make any modifications once the report has been generated. Softworx realizes that ChiroWrite is one part of the systems you have within your office. We therefore interface with billing systems. Check to see if we interface with yours and what's needed if we don't yet. You can customize the CPT Codes to include only those you use or add others as needed. You can customize the Diagnostic Codes to include only those you use or add others as needed. ChiroWrite is built to use the latest operating systems. ChiroWrite will work on the following operating systems: Windows 8, Windows 7, Windows Vista, Windows Server 2008, Windows Server 2003, Windows XP Tablet PC Edition, Windows XP, and Windows 2000. We believe that our software will revolutionize the way Chiropractors assimilate data today to generate the necessary documents and reports to satisfy requirements. Contact us for more information today.